Because is derived from , it can contain one of the two elements derived from —either or . The Camera (or LookAt) specifies a viewpoint and a viewing direction (also referred to as a view vector). The PhotoOverlay is positioned in relation to the viewpoint. Specifically, the plane of a 2D rectangular image is orthogonal (“at right angles to”) the view vector. The normal of this plane—that is, its front, which is the part with the photo—is oriented toward the viewpoint. Google have just bought Panoramio too (see the GE blog), so I wouldn’t be surprised to see the Panoramio material appearing in this new form. 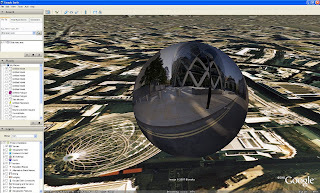 I’m not sure if you’ve seen this tool yet, but Frank Taylor of Google Earth Blog showed me the Space Navigator yesterday at GDD07 that allows a camera view as part of the navigational controls. Check out his blog for more info.